Branson Ticket & Travel - Dixie Stampede in Branson, Missouri is fun and affordable for the whole family. Branson Ticket & Travel - Does your family have less to spend on vacation this summer? More than half of Americans surveyed report their family vacation budgets have gotten smaller, due primarily to rising fuel and food costs. The majority report they still plan traditional summer getaways, but are looking for value wherever possible. Families are traveling by car and choosing destinations closer to home for that much needed vacation. 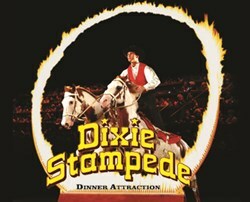 To buy tickets to Dixie Stampede Click Here. Branson, Missouri, one of America's top family vacation destinations, hosts over eight million people each year. With over 100 shows, 200 lodging facilities and 400 restaurants, there is something for everyone in the family to enjoy! "My family and I try to visit Branson twice a year! The Dixie Stampede is always on our must see list! The food and show are the best no matter what time of year! We are a family of limited resources and we thoroughly enjoy the Dixie Stampede! The staff is always courteous and helpful. Our Waiter was very friendly and was easy to engage in conversation when time allowed. It amazes me how quickly and efficiently the food is served to a large number of guests, I have been chosen to represent both the north and south on different occasions, and have won the "horseshoe pitch" at least once. No matter what season the Dixie Stampede and Branson, Mo. is always a hit with our family!" "I would give the dixie stampede eleventy-billion stars if I could. This place is FANTASTIC. My kids loved walking by the horse stables and petting the "horsies" before the show. The pre-show magician guy was hilarious and impressive. The actual show was awesome in its own right and kudos to all the performers. But the meal was by far the best part. The chicken and ham was delicious, the bread was sooooo good, the soup was great and the best part was there is no silverware! You just eat everything with your hands. I will return to the Dixie Stampede. You can bet on that." For a FREE Branson Vacation Planner and Showguide Click Here. For more information regarding show times and ticket prices, call 1-800-432-4202 or 417-335-2707.